A Con Edison spokesman called the transformer fire an "abnormal event" and said, "It did create a spectacular effect on the sky, and certainly caused a lot of concern"
Gender reveal party gone wrong? Alien invasion? Optimus Prime vs. Megatron? 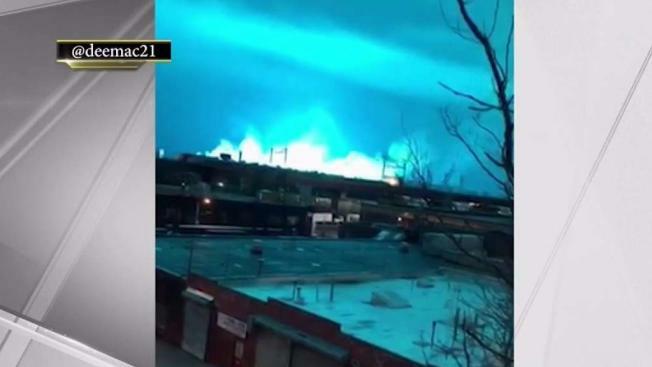 It was an electric blast, people, that sent a crazy blue light flooding the nighttime sky in Queens, briefly making it look like daytime in some neighborhoods. No one was hurt, but the illumination was certainly out of this world -- and New Yorkers have jokes about it. See some of the Twitter chatter below and get the full story here (including some pretty incredible photos). Smdh. ConEdison initially thought it was Optimus Prime and Megatron fighting it out over Queens. We just found out what Twitter would have looked like if the Ghostbusters movies happened in real life. Folks on twitter reacting without surprise to the prospect of an alien invasion in NYC is peak 2018. "Fire at the Astoria power plant"